There are many different hearing aid styles available, and each hearing aid style offers various benefits and advantages to serve a wide range of diverse hearing needs. There are many different hearing aid styles available, and each hearing aid style offers various benefits and advantages to serve a wide range of diverse hearing needs. While choosing the perfect hearing aid may seem overwhelming at first, a visit with your audiologist can provide you with the right professional opinion to guide you towards the ideal hearing aid for your lifestyle. Consider the many different types of hearing aids and their unique advantages as you choose one that works best for you. These hearing aids are inside of a small cast fitting either partially or entirely inside the ear canal. Their snug fit inside of the ear canal makes them a favorable option for functional and cosmetic reasons. Although ITC and CIC aids are among some of the tiniest hearing aids available, they are incredibly useful devices, offering many advantages for practicality and comfort. The working parts of ITE aids are inside of a shell within the outer part of the ear. Because ITE aids are larger than canal aids, their large size makes them easier to handle than smaller hearing aids. This hearing aid style is also ideal for individuals with arthritis, as their larger frame allows for easier handling. The BTE aid is a hearing aid with working parts contained in a small plastic case that rests behind the ear. This case attaches to an earmold by a tube. BTE hearing aids are often an ideal choice for young children, as they are easy to adjust and capable of greater sound amplification throughout the day. Similar to the behind-the-ear hearing aids, the speaker of Receiver-in-Canal aids rests inside of the ear canal. The acoustic tube of these hearing aids is a thin electrical wire, unlike the tube of the BTE aid. 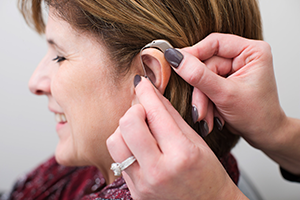 This style of hearing aid is most commonly utilized by adults, as it offers several cosmetic listening advantages. This entry was posted on Friday, October 5th, 2018 at 10:18 am. Both comments and pings are currently closed.